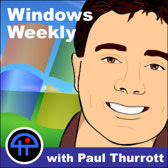 Yes, few have noticed this, except you, O great Thurrott. Because you, unique among all men, understand the great master plan that underlies everything Apple does. So nice of you to bless us with your genius, and to let us know how special you are. Otherwise we might not have figured it out.